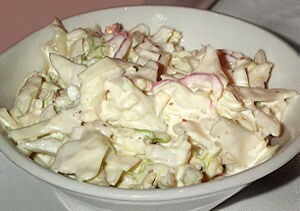 Coleslaw recipe by swtmanoo at PakiRecipes.com. A hearty and flavored mixing of cabbage, pineapple, carrots and onions. In a large bowl, mix the onion , cabbage , carrots, Greek yogurt, and pineapple . Season with salt and pepper, paprika, and garlic powder. Chill 30 minutes in the refrigerator before serving.